TV presenter Douglas Lwanga has recently shown that fame is something very hard to handle through his last social media posts. The entertainment guru came out over the weekend to trash biased bloggers, thank God Campus Bee ain’t one of them. According to Douglas, having Data does not give anyone a right to become a journalist as he thinks it can make other people’s life difficult. In his bitter statement he dubbed open letter, Douglas fired at anonymous writers who probably wrote more than they should have. Lwanga who also happens to be the main host for “The Beat” went ahead to suggest that Makerere University should introduce courses teaching people on how to use Facebook, “Maybe we need some Facebook lessons or the government needs to put a course at Makerere University say a Bachelor of Arts in Facebook use. 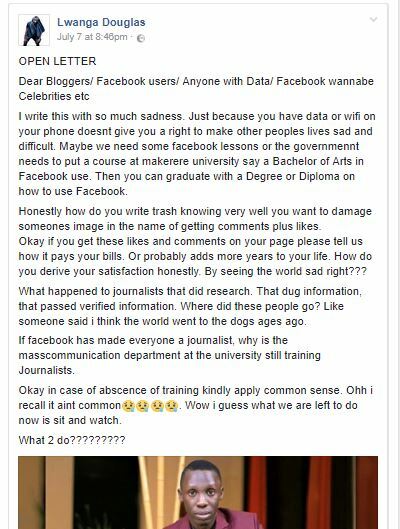 Then you can graduate with a Degree or Diploma on how to use Facebook” angry Lwanga posted. It is not yet clear what kind of article upset this entertainment presenter. MARGARET NAKAYE CROWNED MISS TOURISM, BUGANDA.